Weed block fabric is an effective way to discourage weeds from germinating and taking root in the landscape. Constructed of 3 oz polyspun fabric, this material is rated for 15 years and is available in a variety of different widths to match your project's requirements. If you are looking for a thicker fabric see our selection of heavy-duty landscape fabrics. Non-woven is made from polyester or polypropylene and offers a long term solution to weed control. This fabric is good for preventing weeds from growing over gravel paths, walkways or with a desert landscape. When used underneath a gravel path it works well to prevent gravel from getting into the soil over time. This fabric is made from linen or polypropylene and has tiny holes within the fabric allowing nutrients and water to enter the soil. This is the perfect fabric for garden beds, trees and shrubs. It is very important that you till your soil before applying this fabric. If you don't, you will have to remove it at some point in order to till and that's just a waste of time. Once you cover the chosen area, you must create holes in the fabric large enough so plants can grow into the soil. Water will easily pass through to the soil and will evaporate naturally for a healthy garden. Manufacturers offer different thicknesses for each of their material types. The thicker the material, the longer it will last but will also be more expensive. Your garden properties should dictate the thickness it will require. If, for instance, the fabric is underlying heavy rocks, the material will have to be thicker than a material used in an herbal garden. Even though this fabric is designed to prevent weeds from penetrating, weeds could get through a very thin material or the material can become damaged or torn. No matter the application, the fabric should be covered with organic or inorganic mulch to prevent ultraviolet damage (unless the fabric is specifically rated for direct UV exposure. The downside to organic mulch is new weeds can germinate and you will have to pull weeds from the mulch if they sprout. That said, not covering the fabric and letting it be exposed to weather elements will shorten its lifespan. Ultraviolet radiation, caused by the sun, will also reduce the fabric's longevity. Some manufacturers do offer fabrics with UV protection so the material will not break down over time. Weed barrier cloth, also referred to as landscape fabric, is the best tool for any gardener in their battle against weeds. Whether for garden beds, walkways or patios, this will make your landscaping efforts a great deal easier. This mesh-like material is available in rolls and is very easy to cut for the right size. You want to install this material the right way for the best protection from weeds. Before laying down your weed barrier, you need to clean up the area first. Remove any weeds that are present within the area for planting. You need to dig up the entire weed, down to the roots, so they will not grow back. Clear away any stones, rocks, sticks and other debris. These items can tear or poke holes in your weed barrier material. As the weed barrier must lay perfectly flat against the ground, you must rake over areas to loosen the soil and smooth it out. If the area has any deep ruts, use soil to fill them in, again the fabric must lay flat against the soil. The weed barrier must completely cover the soil to be effective. The edges of the fabric should extend beyond the area just a little bit. Once you have secured the material, you can trim off any excess. Overlap the weed barrier fabric where another piece meets by approximately 6-inches. Overlapping prevents weeds from attempting to grow between the joints. When laying down the fabric on curves, such as a pathway, cut a few slits along the edges in order to help the fabric bend. Smooth out the fabric as you make contact with the ground. Once the fabric is in place, you will cover it with mulch, gravel or pavers. Once one of these materials are placed over the barrier, they will prevent the material from moving. Check the material once in a while as the fabric can still shift over time. Should the fabric shift, it can leave gaps that will allow for the growth of weeds. The best thing you can do, is use landscape pins or staples to hold the fabric securely in place before covering it with your mulch or gravel. If you are creating an edging to your landscape, these pins are used for securing the edges and will also secure the fabric. If you are using this landscape fabric in your garden bed, you have to cut holes in the fabric for your plants. If this is a new bed, lay down the fabric first and then cut holes large enough for your plants to fit in. 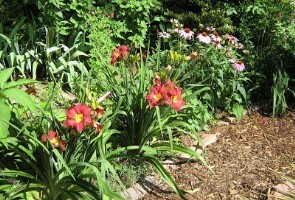 If you already have plants in your garden bed, you will have to cut pieces of fabric to fit snugly around your plants. Overlapping the pieces will keep weeds from growing. This should give you a good idea of which fabric should be used for your specific project. 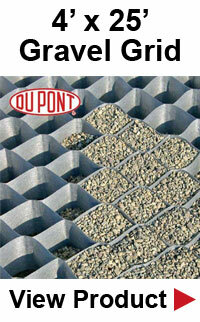 Non-woven is ideal for walkways, gravel paths or desert landscaping and patios. 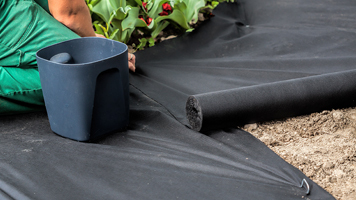 Plant beds require a permeable weed barrier fabric in order to allow nutrients and water to get to your plants' root system for healthy growth. Follow these instructions and you will have a wonderful and very attractive landscape that will last for a very long time. Keep in mind, the idea is to keep weeds from growing over your pristine walkways, paths and plant beds. It will save you a great deal of time from constantly pulling up weeds.